You are currently browsing articles tagged Ravelry. 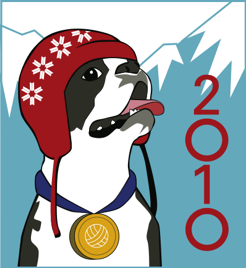 I remember watching the Olympics as a kid and I was always most interested in the winter events. Downhill skiing, all manner of ice-skating, and luge/bobsled are probably my favorites. Through college I didn’t have as much time to pay attention but I do remember sitting with Rich rolling our eyes at Bob Costas’ commentary. I think the kids are old enough now to enjoy watching. I haven’t had a chance to look up the schedule, but it’s fortunate that this is February break here and we may be able to watch some events live this coming week. We’ll mix that up with some winter sports of our own. Skating on the town pond, and maybe some sledding if we get some fresh snow, the stuff we have is rock hard and dwindling. The L.L. Bean MotherStore is running a week long series of mostly free events for kids; I think we’ll be checking out the Taxidermy Safari, maybe some puppets and juggling, crafts and hot cider, and definitely the Chewonki Foundation‘s Live Owls of Maine exhibit. The boy has already previewed the last one at school but I’m sure he’ll be excited to go again. Owls are pretty high on his favorite animal list. And what is Ravelympics? Ravelympics is a for-fun spinning/knitting/crocheting/weaving/whatever kind of fiber crafting event held on Ravelry, a sprawling online community of knitting/crocheting, weaving/spinning type people. Annie sucked me into Ravelry and now I’m being sucked into Ravelympics. 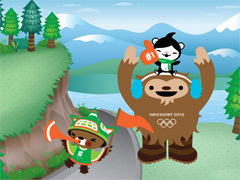 The basic idea is that Ravelers will be participating in challenging yarn events during the Olympics. There are all kinds of categories to choose from and all you have to do is tag your project, post photos and start and finish between the official opening and closing ceremonies. This is good for me, I need deadlines! So here’s my project/event: I’ve been working on figuring out what socks to make for myself from the spiced pumpkin yarn I spun and dyed. I’ve finally picked the pattern (Irish Ale by Nic W a.k.a RedScot) and figured out my gauge, I hope! Of course, I can’t just follow the directions, because, well, that’s just me. So I’ll be knitting these socks toe-up instead of cuff-down as written, which means some scary upside down freeform thinking that I have to be able to duplicate on the second sock! I may or may not add the “froth” at the top. If I do I’ll have to spin some bunny fur. And at the end of the Olympics will be another fibery event, NETA’s annual SPA, Knit and Spin in Freeport. And I doubt I can go two weeks without spinning so I’ll probably start on the last six ounces of oatmeal BFL. 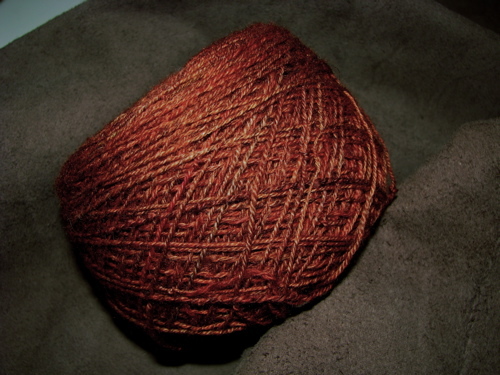 I’m planning on spinning into sock weight three ply and dyeing it blue and green for Topographie inspired socks.